In this experiment you will build your own cold lava lamp! Regular (hot) lava lamps work by heating up wax inside a glass bottle that also has water in it. The hot wax expands a little and becomes less dense than the water, so it floats to the top in large blobs. When it cools back down, it becomes denser and sinks back to the bottom to be heated up again. You can recreate this same effect at home using a different principle and easy-to-find materials! 1) Fill your bottle or jar about ¼ of the way full with water. You can add food coloring to this now, or wait until the next step for a neat effect. Adding lots of food coloring to get deeply-colored water is best! 2) Add vegetable oil to fill the rest of the bottle. Notice how it does not mix with the water, and floats on top of it! From now on, do not shake the bottle! This will cause the oil and water to form lots of tiny droplets that will take a long time to settle back out. 3) Take an Alka-Seltzer tablet and break it in half. Drop one of these pieces into the jar, and watch what happens! Do not leave the cap on the bottle when it is bubbling – dangerous pressures will build up! Here’s a video of mine in action! 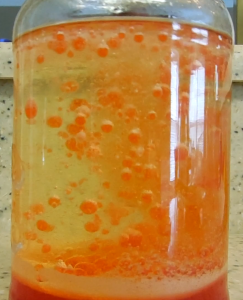 - This experiment recreates the lava lamp effect without using heat, by using Alka-Seltzer tablets to make bubbles in the water layer. These bubbles rise through the oil, carrying blobs of water with them. The dark food coloring lets us see these blobs easily. When the bubbles pop at the surface, the water that was attached to them sinks back to the bottom. - If you waited to add the food coloring until after pouring in the oil, you’ll see that the drops of color also do not mix with the oil. When they reach the water layer, they burst and flow into it like normal. This is because the food coloring is water-based, so just like the tap water it will not mix with oils. If the drops do not pop on their own, poke at them with a fork. - Your cold lava lamp is reusable and will work with many Alka-Seltzer tablets. Eventually, the water will become saturated and more tablets will not react to form bubbles any more. You can refresh the lamp by carefully pouring the oil into another bottle, disposing of the used water down the drain, and following the steps again with fresh tap water and food coloring. You can always reuse the same oil. I love the science brothers and the experiments they make. Alka Seltzer tablets fizz because of an acid/base reaction. The tablets contain citric acid and sodium bicarbonate (baking soda). When dropped in water, these dissolve and react together to release carbon dioxide gas. This makes the bubbles you see. This is very similar to the vinegar and baking soda “volcano” experiment, if you’ve ever done that! As part of this Cold Lava Lamp experiment, these bubbles carry blobs of water with them into the vegetable oil layer. The bubbles pop at the surface and the water falls back down. The tablets are ordinary Alka Seltzer medicine, found in just about every convenience store on Earth. There is nothing bad about chemicals! Water is a chemical, air is a chemical, food is a bunch of chemicals, and you are made entirely of chemicals! Chemical isn’t a “dirty word” and people shouldn’t be afraid of them. If you treat your chemicals with respect you can have lots of perfectly safe fun and learn quite a bit at the same time. If you used heat does it change the outcome I.e speed up the bubbles (referring to a homemade lava lamp) and if so why does heat change the reaction? Heat speeds up all chemical reactions, so heating the lava lamp before dropping in the Alka Seltzer should speed up the bubbling! Adding heat makes the molecules move around faster, so they bump into each other more often and this makes chemical reactions happen faster. Go ahead! Just be sure to cite us as one of your sources! Wow thanks so much! I’ll be sure to give you credit!